This film was commissioned by The Stanley Park Ecology Society to document the first part of their Creative Upcycling Project in Stanley Park, in Vancouver, Canada. Biologist Erica Forssman, shows volunteers how to remove invasive plants, such as Himalayan Blackberry and English Ivy from Blowdown sites, where sunlight has given these plants an advantage over native species. Environmental Artist, Sharon Kallis then helps to repurpose the removed material, that would otherwise be considered waste. With help from SPES Stewardship Coordinator, Sam Cousins, volunteers weave blackberry wattle fences and install ivy Bio-netting to restore the eroded banks of North Creek, an environmentally sensitive site in the park. I recently finished work on the film documentation of The Urban Cloth Project. Sharon Kallis, Tracy Williams, Mirae Rosner and Rebecca Duncan worked together to make this project happen. It looks at how we can grow and process fibre to make cloth in our own community, and what is involved in the large-scale industrial production of clothing around the world. Original music composed and performed by Clara Shandler. Synopsis: David Gowman, aka Mr Fire-man, is the creator of “The Legion of Flying Monkeys Horn Orchestra.” Equal parts arborist, musician, craftsman, and agent-provocateur, his songs mirthfully take the piss out of consumerism, conformity and religion with hits like Aliens, Too Much Pie, and Zombies, played in clubs, festivals and community gardens of Vancouver’s Downtown Eastside. 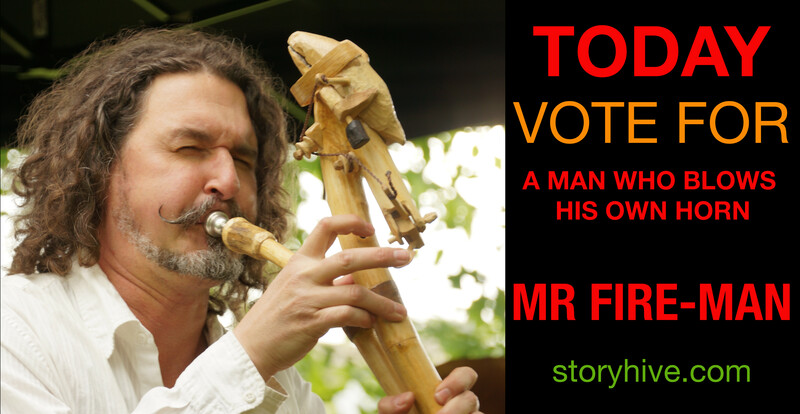 He sustainably harvests a local Paulownia tree and other renewable crops to build his eccentric instruments. With his artwork, concerts and workshops, he activates both friends and community in ways that are thoughtful, provocative, and life-affirming. This is a story of one man who has turned away from mass-culture and consumption, and has built his own life in a sustainable way, enriching the local environment around him. Between October 26 and November 8, 2015, you can vote once everyday to give me a chance to win 10,000 dollars to make this film. This is a short film I made back in 2013. In 2013, the Community Arts Council of Vancouver commissioned artist and weaver Alastair Heseltine to create a green willow sculpture in honour of the Chinese year of the Water Snake. Built over a period of five days in January with the help of community members, the 60 foot snake was then paraded through Chinatown before being installed in the Sun Yat Sen Classical Chinese Garden. This short film documents the frenzied pace of construction, as a small army of volunteers work against the clock to shape a truckload of willow branches into cross-cultural symbol of power and regeneration.